Like the Omni 12F this project is specifically for woodworking newbie's who don't have a lot of experience or a lot of tools. You can build it with midrange and tweeter for a full range high efficiency single box system, with or without tweeter for electric bass. Before this I was playing through either a Peavey BX 1x15 or a Trace Elliot 4X10, depending on whether I could be bothered to lug the dead weight of the Trace to gigs. I also do a few gigs where a backline is supplied, usually an ampeg 6x10, sometimes 8x10 sometimes 4x10. So how does the O15 sound? It is noticeably louder than either of my other cabs at similar settings, but that wasn't my overall impression, 3 words ... PUNCHY .... DEEP ... CLEAR ... The sound is really really HiFi and does come through as Bass, Middle, and Treble. 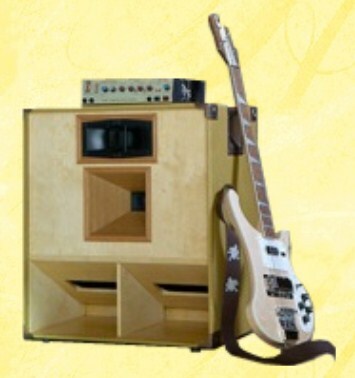 When I turned up or down one of the controls on my bass the corresponding speaker got noticeably louder or quieter! I know it's designed to do this but it still blows me away, and spent ages with a stupid grin on my face doing exactly this. The top end is crystal clear. When you slap at volume I'd advise you sit well back, the top end is truly eye popping. Midrange is really really punchy, and not like many 4x10's with that kind of grunty sound but a much more clear and defined note that doesn't distort. I've always used solid states and relied on cabs to give me that little bit of grunt, however since I've been playing this I've had the 'warm' button (basically a valve emulator) on my amp permanently on, as is the grin on my face The low end is just awesome, it is a really clear deep bass that doesn't boom, and projects well, and handled every low B I threw at it with ease. I found with this cab I didn't need the 'bass boost' on my amp turned on (I would normally have it on), as it already sounds sweet and deep and coupled with the other drivers sounds great. Without doubt it's the best sounding cab I've ever used. On average 3dB higher in sensitivity than a reflex box, the Omni uses half the watts to reach the same volume level. The sensitivity from 40 to 100 Hz is as good as most 15 or even 18 inch subs. 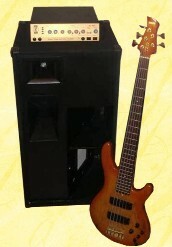 Compared to factory built bass cabs the Omni has deeper lows, stronger mids and unsurpassed highs. Keyboard players will love the low register authority. I challenge you to find a commercial speaker that delivers this kind of performance for less than a thousand dollars. You can build one for less than four hundred bucks. The plans go into great detail. There are 25 pages in all, with dozens of pictures and diagrams. For those who prefer a cab with a higher and narrower profile, consider the Omni 15 TallBoy. The narrower footprint of the 20 inch wide, 39 inch high O15 TallBoy is stage friendly in smaller clubs, and gives better projection over the audience in PA applications, while delivering the same response as the original. The Omni 15s are stand-alone cabs, for use without separate subwoofers. If you're looking for easy to build PA tops to use with subs, or need to cover larger audiences, check out the OmniTop 12, OmniTop 15, SLA Pro and the Simplexx series. The plans are $14.95, delivered within 24 hours as email attachment in MS Word format. PDF version available on request. The Omni 15 Fullrange and Omni 15 TallBoy are different projects with different plans. Be sure to indicate when you order which plan you want.